If we're going to talk about Jill Sprecher's Thin Ice, we're going to have to talk about its ending, though we'll wait to do so until the end of this review (and then only in veiled terms). Until then, let the record show that this is a fast, scrappy black comedy/thriller in the Fargo mode--c'mon, they even made it snowy and Midwestern. Accepted on its own specific terms (as a skillful riff on an oft-told tale), it works. We meet Mickey Prohaska (Greg Kinnear) at a particularly depressing insurance conference--though, in all fairness, moviemakers don't seem aware that there's any other kind. Prohaska is a slick agent who seems to have it all together, giving talks on cold calling and picking up awards for his good work. It's all an act, though, a hustle; he's a bad husband and a worse liar, fronting like a big success but barely making his numbers match up. Mickey's a schemer, always chasing his next score--which, usually, he needs to pay off the last one. That's when he meets Gorvy Hauer (Alan Arkin, sporting a delightful Scandinavian accent). Gorvy's a potential client, an easy mark for an inflated homeowner's policy, but Mickey finds out he's also got an unexpected treasure: a rare violin valued at several thousand dollars. Mickey hatches a plan: steal the violin before Gorvy realizes what he's got, sell it "for" him, use the cash to pay off his debts. Simple. Unsurprisingly, it does not turn out to be all that simple. I've got a weakness for stories like this, tales where the pursuit of easy money takes a bad turn and keeps spinning further and further out of the desperate protagonist's control. (A Simple Plan leaps to mind.) The screenplay, by Jill and Karen Sprecher, sports a good, tight plot--one thing falls right after the next with a kind of nightmare logic, each bad idea begetting another, and Mickey is particularly ill-equipped to handle the spinning plates crashing around him. This is a guy who, for the life of him, just can't come up with a plan that'll hold, and if his improvisations fail, it's because he's nowhere near as smart as he thinks he is. That's a tough act to put across, but Kinnear is up to the task--he plays desperate instead of dumb, and it's a good fit. Though complications too complex to explicate, Mickey ends up with an unfortunate partner in the proposition, an ex-con locksmith named Randy, played by a spiky Billy Crudup as a guy who can fly into a rage with a quickness. There's a very specific kind of menace to his performance--he doesn't do any of the customary moves, but instead views everything that has happened and will happen with the same straight-faced intensity. This is a guy who asks "You ever seen a meth lab blow up?" one moment and "Have you ever had the cheese curds here?" the next, and gives each query about the same weight. There's an edgy unpredictability to this guy, which makes the threats he holds over Mickey (of exposure, or worse) all the more potent. The Sprecher sisters have made two previous features: the enjoyable Clockwatchers and the underrated, rather heart-wrenching Thirteen Conversations About One Thing. The latter was particularly memorable for one character, Wade "Happy" Bowman, a relentlessly upbeat character that is utterly crushed by a cynical world. There is a comparable character here, though his predicament is not as affecting; the filmmakers are mostly going for dark chuckles here, instead of pathos, though Arkin approaches real sentiment in a late scene of desolation, despairing to an exhausted Mickey, "It used to be that you could trust people." Now, the ending. (We'll keep it vague.) This viewer is still on the fence about the turn which the Sprechers take--on one hand, it's a divergence from the familiar pattern the story has thus far taken, but on the other, I'd almost rather they'd seen the dark tale through than go for a blarney. It's a clever conclusion, sure; I'm just not certain it's an honest one. 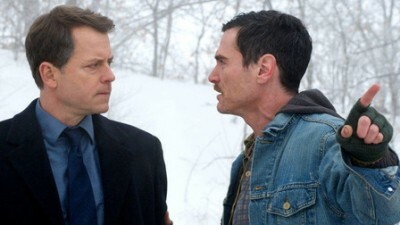 Nevertheless, there's much to recommend in Thin Ice--sturdy performances, solid construction, a good eye for composition and cutting. You'll have to decide for yourself about that ending. Buy tickets to "Thin Ice" now!